2015 / Emily Erickson, Victor Narro, Janna Shadduck Hernández, Abel Valenzuela Jr.
Southern California is home to a large, diverse, and iconic carwash industry. Employing over 10,000 workers and providing investment opportunities for hundreds of business owners, the carwash industry constitutes a significant share of the region’s business community. 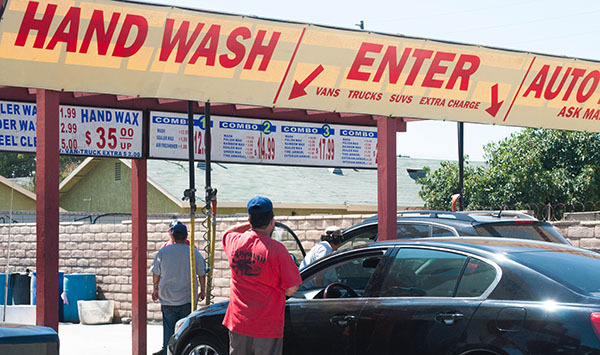 The UCLA Labor Center’s report, Conveying Carwash Owner’s Stories: Competition, Diversity, and Growth in the Southern California Carwash, provides an introduction to the industry, its owners, and the opportunities it affords across the Southland. Nearly 90 percent of respondents viewed the presence of unregistered, low-road carwashes as very or somewhat negatively affecting their business. Many (56 percent) Southern California carwash owners are first generation immigrant entrepreneurs and reflect the rich cultural diversity of the region. Carwash owners are major employers within the region’s service industry. Respondents employ an average of 20 workers that scrub cars clean. The margins of profit are 16 percent on average indicating that effectively managed carwashes have the potential to implement high road business practices while still earning significant profits. Water conservation and environmentally friendly “green” practices are of high concern to many carwash owners, led in part by changing consumer awareness to such issues. Two thirds of respondents viewed the rise in green-conscious consumers as a positive trend. There is potential for industry growth as green practices attract environmentally-conscious consumers. The study found that 66 percent of surveyed carwash owners viewed the rise in green consumers as positively impacting their businesses. Many carwashes already employ green tactics–most notably water recycling. The average home carwash can use 140 gallons of water, while a professional wash using recycled water uses only 45 gallons. The findings are based upon a mail survey of registered carwash owners from four Southern California counties in the greater Los Angeles area: Los Angeles, Orange, Riverside, and San Bernardino counties.